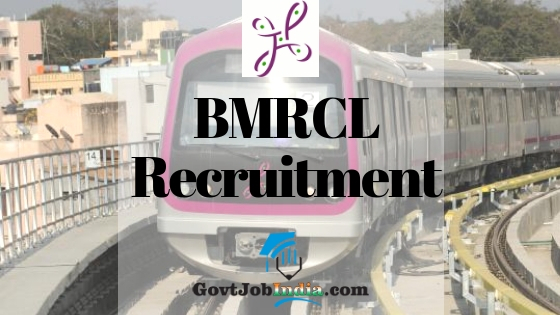 BMRCL Recruitment Bangalore– The Bangalore Metro Rail Corporation Limited has released a recruitment notification for hiring 174 posts of Maintainer, Junior Engineer and Section Engineer. The official website where you can apply online is www.bmrc.co.in. This BMRCL Recruitment is for engineers with diploma holders and freshers. Candidates can apply now before the last date and get a chance to secure this position in one of the most prestigious organizations of the city. The final date to apply online for this recruitment is 2nd February 2019. The BMCR Notification will give you the details of the entire post and the various parts of the recruitment process like the eligibility criteria, selection procedure, application fee etc. We have covered all the parts of this in our post and you can refer to our article for any of the details which you will need to apply for this recruitment. But in case if you have additional doubts related to this, you can refer the BMRC Recruitment Official PDF which is attached at the bottom of the post. Furthermore, this is an amazing opportunity for all those looking for an engineering job in Bengaluru and this upcoming govt job can prove to be quite a chance for all those who wish to take it up. So, without further ado, let us move onto the recruitment details, one section at a time. Offline Payment methods are not accepted during the Bangalore Metro Recruitment fees payment. The payment methods are given below for each of the category wise application fee details. How to Apply Online For BMRCL Maintainer & Engineer Recruitment 2018 @ BMRCL Careers? All those who wish to apply online for the recruitment of the BMRCL should note that they can apply for the recruitment can do so by going through the steps enlisted below. 1. Visit the official website of the Bangalore Metro which but to apply directly, go to the link given below. 2. On the main screen of the BMRCL website, click on the “Careers” section. Click on the Online Application Form” option. 3. Carefully complete the application form and attach all your required documents onto the form. 4. This must be exactly in the measurements sent in by the BMRC recruitment notice. 5. Submit your form and pay the BMRC application fee. 6. Download the fee receipt onto your computer and save it. Furthermore, it would be better if you save the registration form and number along with it as well. 3rd Floor, BMTC Complex, K.H.Road, Shanthinagar, Bangalore- 560 027. Certificate and marks cards for educational qualifications mentioned in the application by you. SSLC/10th Standard/ Matriculation certificate showing your name, father’s/mother’s name, last name if any, and the Date of Birth. If you belong to reserved categories i.e. SC / ST / Cat I, Cat IIa, IIb, IIIa, IIIb as mentioned by you in the application, Certificate from the competent authority certifying the same. Please see para No. 1.08 of General Instructions for further details. If you belong to Ex-servicemen category, Certificate of Discharge issued by the Competent Authority in Army / Navy / Airforce indicating date of joining, date of discharge and rank held, along with other details (please see para 1.08 of General Instructions). Character Certificate obtained from Educational Institution / Gazetted Officer on or after the date of Employment Notification. Please make sure that you are eligible for the posts which you are applying for. The candidate must fulfil requisite Educational /Technical qualifications as on the closing date of submission of the application. Those who are awaiting results of their final examination should not apply. Candidates should have fluent knowledge in the reading, writing, speaking and understanding of the Kannada Language. The BMRCL Project Recruitment is an amazing opportunity for all those who wish to secure a govt job in the Bangalore Metro Project. We have given all the details of the recruitment here on our page and we hope you found it useful. If you did find this article about the various Namma Metro Jobs in Bangalore, then make sure to help another out by passing this information to them as well by sharing this article. Furthermore, any doubts about the BMRC Maintainer recruitment, comment below and we will let you know as soon as possible. In conclusion, subscribe to our website @ GovtJobIndia.com and you will be notified of the latest engineering jobs in the country.